This poem needed some Holy. This poem needed a lot of everything, but instead of retiring it, like poor Poem 51, I decided to give it more power in reference to a poem far beyond my league. The reference process is a little touch and go. I will not get onto my long drawn out soap box about the literary conversation and all the things that make every poem connected to everything else, bla bla bla… if you really want to hear all that comment below and I will be sure to bend your ear. In this shorter commentary I will simply detail a few potholes about the poem world that are becoming issued as the new, less read generation, rises to their feet. No one. Not even the english majors. Now that everything is on the internet, we read more and dig a little less into our favorites. Not that we don’t have favorites, but there are more pressing things to do than memorize lines. We can just link them. Instead there will be more power in referencing the more memorable bits of poems outright and footnoting those parts that are harder to know off hand. For this one, the Holy sort of spoke for itself. So I left it. Maybe later I will make it more visible, but for now I hope they stand. 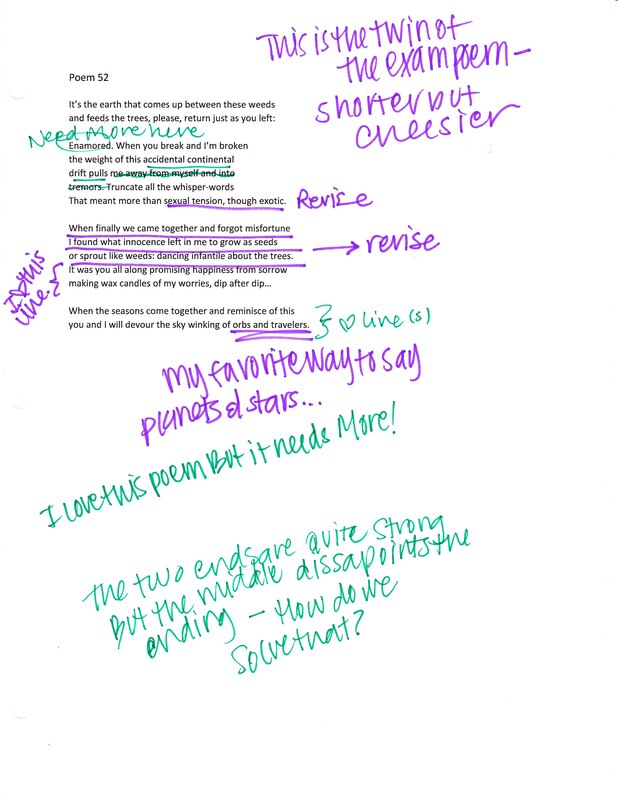 If you want your reader to take the extra step and see a reference, make it seem like a different piece of the poem. Repeat it. Italicize it. Mark it with a dash. Put it somewhere strangely on the page. The interested reader will take the time, but only if they sense that there is something else other than just your words. There will be so much power in your reference that gets lost when you don’t distinguish it from anything else. So what if no one knows you referenced Keats’ little-known play in your sonnet about love and loss. The point is depth, the point is conversation, the point is reverence. Someday, someone will see that for what it is. Like letting a bottle message into the sea, your hope is that someone finds it and begins their own adventure. If you wanted someone to get the message right away you might as well have sent an email. This poem was a mess. I needed much more change and freshness to come in and take out the stale. The heartline–that first line–stayed the same, so I feel the point is intact. However, these tactics are strong ways to give the poem an outside reference point. References can make or break a poem and a poet so read well and remember the changing landscape of the poet and reader will affect the way you write for the future. Perfect website, keep up good work.